In medicine, as in life, things can fall out of the commonplace only to resurface down the road, more popular than ever. One such example is the neti pot, a device used to help with nasal and sinus congestion. Neti pots are vessels made for pouring a water-salt solution into the nostril to irrigate the nasal passages and sinuses. This solution allows the mucous to exit via the other nostril. Today, they can be made of plastic, glass, metal, or ceramic, but all taper to an end that fits snuggly in the nostril. It's a design which was first described centuries ago in India! Descriptions state that, in that time, they were made of clay and called for a salt additive similar to that used today. The irrigation was commonly used in Ayurvedic Yoga practice to improve breathing, which is important in relaxation and meditation. In the early 1900’s, the neti pot finally made its way to America, where it was prominently used to treat sinus congestion, until the rise of pharmaceuticals pushed the tool back into obscurity. Recently, though, with reports on their risks and studies showing they do nothing to shorten a cold's duration, there has been a backlash against pharmaceutical remedies. Further, products containing pseudoephedrine are now regulated due to their use in the manufacture of crystal meth (a highly addictive illicit drug), and nasal sprays using the same type of stimulant cause rebound congestion and an “addiction” to the product after just a few days of use! As such, the neti pot has re-emerged as a more common-sense solution. Though somewhat controversial, this novel tool does indeed seem to help with congestion/sinus problems and research is emerging with supportive data. Much research has been published on the use of neti pots in recent years. Neti Pot for Chronic Rhinosinusitis: Studies show that routine nasal irrigation for chronic rhinosinusitis (congestion and inflammation of the sinuses for greater than 12 weeks) improved quality of life, reduced antibiotic use, and improved symptoms of nasal congestion and discomfort. Neti Pot for the Common Cold: In regards to the common cold, results are mixed. While some studies show improvement in symptoms and quality of life, use of a neti pot didn't shorten the duration of illness. Those who used a neti pot routinely for maintenance, however, did show a decrease in the frequency of colds. One study did show that use in children for the common cold significantly improved symptoms. Neti Pot for Allergies: In regards to chronic congestion due to allergies, neti pot use has been shown to improve symptoms and even lower the body’s chemical response (the stuff that causes all the congestion) to allergen exposure. A survey of family doctors showed that 87% actively recommend using a neti pot. Neti pots are generally considered safe. Recent bad press has highlighted two deaths that occurred in Louisiana due to the use of tap water contaminated with amoeba in a neti pot. The exposure of the microorganism to the sinuses caused infection and inflammation of the brain leading to death. This has prompted a warning to use distilled or filtered water for neti pot irrigation. Using the salt additive is also important to prevent this ultra-rare complication. Centuries ago, neti pots were made from clay, but this would not be recommended today due to the material's potential to harbor debris and infection in the porous structure. Today’s neti pots components are much more sanitary than previous models. All things considered, neti pots are safe and yield far less side effects than pharmaceutical remedies. Safety has even been shown with long-term daily use and with use during pregnancy. 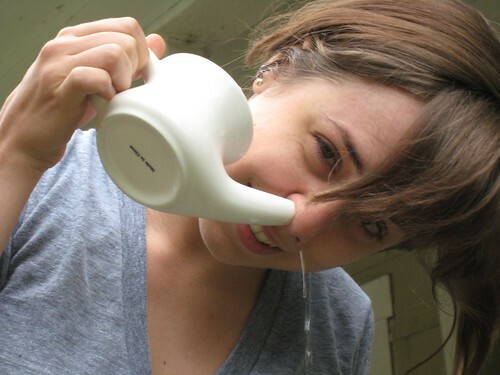 Using a neti pot takes some practice. It takes just the right positioning and pouring angle to yield a successful cleansing. Some people like it and some people don’t. My wife is a neti pro; our kids line up to watch her in action, considering it on par with some parlor trick. I, on the other hand, still lack the coordination for a successful irrigation. My first attempt at using a neti pot could be described as “self-waterboarding.” Nonetheless, I have not given up on my neti pot. The neti pot is again growing in popularity and it offers a safe, effective treatment for sinus congestion. Thanks Dr. V! I've been considering one of these for some time now. My allergies really fire up after I mow the field, and I hate having the congested feeling for three days after mowing. I have found that a cool shower immediately after exposure really helps, especially if you can let yourself fill up your nostrils with water. Guessing it's like using the neti pot without the pot. I have wondered about this myself. I have seen it done, but it seems almost impossible that it helps. I'm glad to hear a doctor's take on this product, I may just try it after all. Of course, I will probably end up with a head full of water or something since I have no idea how to use it. It always cracks me up when I see a family or friend use one of these, but I may just have to try it myself the next time the need arises! Pharmacogenomics: When A Treatment Fails To Deliver, A Cheek-Swab DNA Test May Reveal the Solution!